JTBC has shown strong momentum not only in drama series, but also in sitcom. 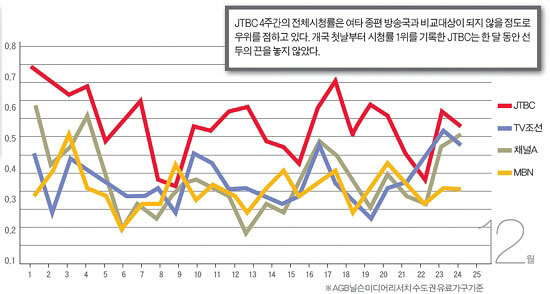 According to statistics released by AGB Media Research Agency on April 10th, 2012, the episode 89 of JTBC daily sitcome I Live in Cheongdam-Dong broadcast on April 9th, 2012 achieved the national viewership rating of 1.035%, an increase of 0.283% from 0.752% recorded in episode 88. I Live in Cheongdam-Dong which seen its audience ratings usually hovers around 0.8% rose to above 1% recently, and has been praised by the viewers. The rating for episode 87 broadcast on April 5th, 2012 even rose to 1.189%. When the miniseries of other general program service channels has to end prematurely due to low ratings, the viewership ratings of I Live in Cheongdam-Dong increased instead. I Live in Cheongdam-Dong plans to have 200 episodes, and the ratings have exceeded 1% not even half-way into the broadcast, heighten the expectation to future ratings. The outstanding performance by people’s mother Kim Hye Ja and the delicate three-party relationship between Ji Eun, Hyun Woo and Sang Yeob play an important role in making the drama series I Live in Cheongdam-Dong a good drama. On the other hand, I Live in Cheongdam-dong is telling the story of a group of poors living in Chengdom-dong which represents the rich in South Korea.